Silver proof has become a common topic among growth and retirement investors, as well as collector enthusiasts. But as global economies continue to encounter strong headwinds the number considering silver proof investment continues to grow, well beyond previous bounds. Proof coins have special features that make them more attractive, more valuable and more in demand. Bullion and precious metal coins grow in value as the base metal value increases. Uncirculated coins are less plentiful, therefore they cost more and offer a value potentially greater than that of the base metal. But silver proof coins only constitute 5% to 20% of the uncirculated coins available in a typical year, creating a greater initial cost, as well as a greater potential for long term demand and value. Silver proof coins are typically struck multiple times with acid treated dies and then specially polished to create a more attractive finish with greater detail in the final product. The entire manufacturing process is far more manual than the standard minting process, so as to create a higher quality product. Grading, labeling and sealing in transparent plastic cases for protection and easy viewing completes the packaging process for silver proof coins. 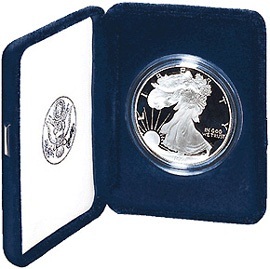 American Eagle silver proof coins are among the most popular financial instruments approved by the IRS for IRA inclusion. Due to the long term nature of an IRA, American Eagle silver proof coins are becoming regular elements in diversified retirement plans. Like other precious metal coins, silver proof coins typically increase in value when standard financial instruments struggle, especially when sudden crashes occur in a market, major market segment, or even an entire economy. The ability of silver proof coins to hedge against the losses of other financial instruments can be invaluable to the success of an investment or retirement portfolio. The use of silver proof coins in an investment portfolio and especially a retirement portfolio is best assessed by seasoned professionals, like those at American Bullion. Call (800) 465-3472 for a free consultation regarding the appropriate mix of precious metals and precious metal products in your portfolio. Depending on goals, most financial planners agree and suggest that a percentage of most investment portfolios should contain precious metal products. Check with the experts at American Bullion to see if silver proof coin inclusion is appropriate for your IRA or investment portfolio.